My brother died some time during the week of July 18. His health had not been great for a while because he had MS. But it was all complicated by the fact that he had been in a number of very bad accidents over the past decade that left him with assorted physical limitations. One year he broke his shoulder, the next year he broke his hip. About a year and a half later he broke his neck in a bad car accident. Still, he worked out every day on a tread mill in his office and his death was unexpected. I kind of thought he’d eventually tell me that he had simply willed his health problems into a minor inconvenience. He was 61. Academically speaking, my brother was an expert in a lot of arcane subject matter I could barely comprehend. He used to joke that he knew nine languages, 3 of which had not been spoken in 2000 years. When someone asked him if he was fluent in Greek, his answer would be the question “Modern or Ancient?” He knew both. After he received his Ph.D. from the University of California at Berkeley in Ancient Art and Archaeology, he was granted a Fulbright Research Fellowship in Cyprus. He loved Cyprus and the people he met there who, he told me, pronounced his name Glown. We found that so amusing that for the entire rest of his life when we left each other messages, we both referred to him as Brother Glown. As a young man he worked on a fair amount of on-site archaeology digs. He also visited and traveled with his friend Thor Heyerdahl who granted permission for Glenn to use one of his photographs of The Kon TIki for the cover of my brother’s definitive book about ‘The Phoenicians’, the civilization that gave us our alphabet. ‘The Phoenicians’ was originally co-published by the British Museum Press and the University of California Press. But recently The Folio Society in London issued the book in a leather bound edition. My brother was very excited about that. He was a leather-bound kind of guy in a digital world. He had no problem understanding Sanskrit but repeatedly told me he was having trouble with G-mail. For the latter part of his career, he ended up curating museum shows and writing academic research papers with titles like The Funerary Iconography of the Lotus Flower. Here is a catalog from a show he directed on women in ancient Egypt at The Cincinnati Art Museum, where he worked as Senior Curator of Classical and Near Eastern Art and Art of Africa and the Americas for 23 years. 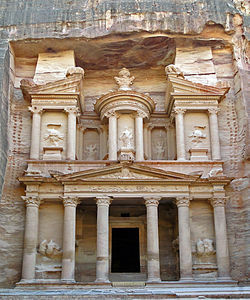 Probably the crowning glory of his career was a huge show he put together with his colleague Craig Morris from The Museum of Natural History in NYC entitled ‘The Lost City of Petra.’ Once referred to in a poem as “a rose-red city half as old as time,” the city of Petra is famous for its elaborate temples carved in sheer rock walls. You may remember it best as the haunting backdrop for Indiana Jones and the Last Crusade. Here is a link to the book my brother wrote about the show. My brother spent ten years working on this project, traveling back and forth across the war torn middle east, visiting the site itself and getting permissions from the Royal Family of Jordan and the Jordanian government to ship various antiquities to this country. Here is a picture of my brother and Craig Morris with Queen Rania of Jordan. My brother is the bearded white haired guy on the left. Here’s a page about him from a website that went up about the exhibit. That period of time stands out most for me as a time when I was worried about him constantly because he was not a guy who ever seemed to sense danger. In my mind, he was walking around with a ‘Take Me Hostage’ sign on his back. Ever since he was a little kid he had always appeared to be preoccupied by a private inner landscape of details from some other century. My parents referred to him as “an absent minded professor.” He was simply very trusting and good natured as he concentrated on his work and went about collecting data for his exhibit,unconcerned that he was not that far from where we had just invaded Iraq. “Merrill,” he used to shout at me when I issued cautionary edicts, “Where I am, it’s perfectly safe.” Still, when I went to bed at night, I had visions of newspaper headlines describing how Al Qaeda had dropped a butterfly net over him and taken him prisoner. Fortunately there was no kidnapping. Instead a great exhibit was the result. Here’s a page about him from a website that was created for ‘Petra Lost City of Stone’. I had never even heard of the culture of the ancient civilization of spice traders called the Nabateans, builders of the city of Petra, until my brother told me about them. During that period he sometimes called me from his research sites in Jordan. Those were the Bush years. I assumed this meant that I was probably having my phone tapped by the U.S. government. It was always fun to attend any exhibit of ancient relics with him because he specialized in knowing about vanished worlds that are invisible to most of us. One time, while showing Andy and me around an exhibit, he took us over to a very official looking piece of inscribed rock sitting in a case on a pedestal. “That was a shopping list from the first century.” he told us. Anyway, he’s gone now. He was a very sweet, funny, smart man and a great father to his two sons, Carey and Noah. And he was my goofy but brilliant brother. It seems surreal that he has suddenly vanished. But as we all learn, such is the weird reality lurking right underneath the one in which we all live. We sent an obituary in to the Cincinnati Enquirer but so far they haven’t published it. I couldn’t wait any longer. So I wrote this. 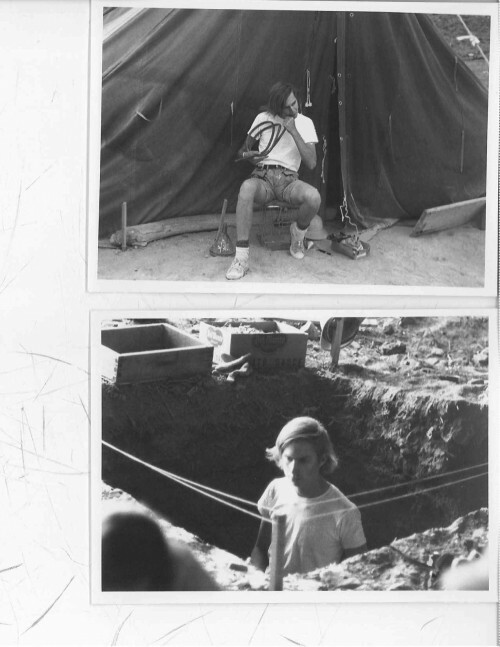 Here he is when he was twenty, on a dig with others from UC Berkeley. This entry was posted	on Sunday, July 29th, 2012 at 2:17 pm	and is filed under blog post. You can follow any responses to this entry through the RSS 2.0 feed. You can skip to the end and leave a response. Pinging is currently not allowed. I just found out about the loss of your brother. I am saddened and shocked. He was a marvelous, brilliant, and funny human being. What is not mentioned is that he was an excellent musician – French horn. We knew one another as undergrads @ Berkeley and later in Grad school. I in education and he of course in anthropology. What you may not know is that he was instrumental in helping to start the UC Jazz Ensembles during its inception in 1971 -1972. Yes he did play French Horn in that Jazz Band – a definite neophobic sound. I spoke with him many years ago about coming to the UC Band Japan Tour Reunion but unfortunately he could not make it. His brilliance in his career is not surprising. We had many conversations about classical music, anthropological terms, and bureaucracy in general. I know this was a loss but know that he touched a musical world as well as an anthropological one. My deepest sympathies to you and the family. I am also sending a photo of Glen with the initial publicity photo of the UC Jazz Ensembles with Glen in it. He is looking scholarly even then./Users/jameshenson/Desktop/Scan 170710001-1.jpg I hope you will enjoy this. Never received the photo. Could you send it to me as a message and it will come to my private e mail!